Rose & Lafoon Building; photo by Michael Hart, 2015. Named for Rose & Lafoon, Inc., a realty company that commissioned it in 1938, the Rose & Lafoon Building houses the offices of the Clerk of the Court of Appeals. The building was designed by Richmond architect Edward Sinnott, Sr. (1890-1971) and is an example of his work in the Art Deco School. Sinnott also designed the Henrico Theater in Highland Springs around the same time. The theater, which opened in 1938, is on the National Register of Historic Places. The Court of Appeals of Virginia provides appellate review of final decisions of the circuit courts in domestic relations matters, appeals from decisions of an administrative agency, traffic infractions and criminal cases, except where a sentence of death has been imposed. It also hears appeals of final decisions of the Virginia Workers’ Compensation Commission. While appeals of criminal and traffic cases, final decisions on applications for concealed weapons permits, and certain preliminary rulings in felony cases are presented by a petition for appeal, all other appeals to the Court of Appeals are a matter of right. The Court of Appeals has original jurisdiction to issue writs of mandamus, prohibition, and habeas corpus in any case over which the court would have appellate jurisdiction, and writs of actual innocence (based on non-biological evidence). The decisions of the Court of Appeals are final in traffic infraction and misdemeanor cases where no incarceration is imposed, in domestic relations matters, and in cases originating before administrative agencies or the Virginia Workers’ Compensation Commission. However, the Supreme Court may review those decisions as well if it finds that the decision of the Court of Appeals involves a substantial constitutional question as a determinative issue or matters of significant precedential value. Except in those cases where the decision of the Court of Appeals is final, any party aggrieved by a decision of the Court of Appeals may petition the Supreme Court for an appeal. 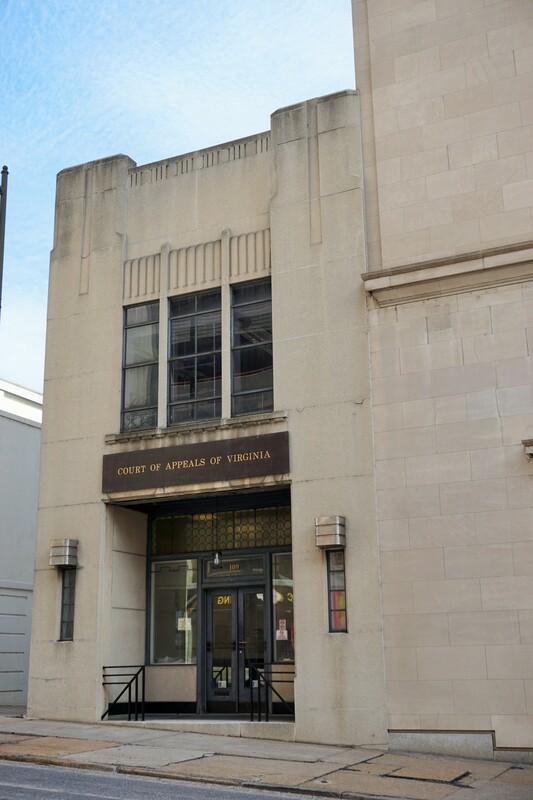 The Court of Appeals is located in the Supreme Court Building and the attached Rose & Lafoon Building in Richmond, with additional hearing locations around the state. The court is composed of eleven judges, each elected to an eight-year term by a majority of members of the General Assembly. A chief judge is appointed by a majority vote of the judges and serves a term of four years. The Court of Appeals sits in panels that consist of at least three judges each. The chief judge assigns members of the court to panels and determines the geographic location in which the panels will hear cases, normally Alexandria, Chesapeake, Richmond, and Salem. Panels hear and determine petitions independent of one another. Under special circumstances the court may also sit en banc (as a whole) with no fewer than eight judges, and these decisions overrule any previous decisions rendered by a panel or by the full court. The clerk of the Court of Appeals receives, processes, and maintains the records of appeals and subsequent documents filed with the court. Virginia’s Judicial System; Acts of Assembly 1988 Regular Session (c. 391), 475; agency history of the Court of Appeals (Record Group 141), compiled in 1995 for the state government records collection, Library of Virginia, Richmond.